Just days ago, we posted the interior teaser image Mercedes-Maybach released of its Ultimate Luxury concept due to be presented at the Beijing Motor Show. Now photos of the entire vehicle, inside and out, have leaked online courtesy of the manufacturer. Thanks to the concept's own microsite being live for a short while, we've gotten a good look of the concept. And it's not just a dressed-up GLS by any means, even if there might be a GLS platform underneath it all: It's a high-riding four door sedan with a clearly formed trunk instead of a traditional SUV shape. There's a big waterfall grille flanked by low, aggressive three-unit headlights, and the detailing is a combination of SUV cues and something a lot more luxurious. It's not easy to design a three-box sedan that's still recognizably an SUV. Inside, there's white leather and rose-gold detailing everywhere. But the big deal is the powertrain, which in the concept is all-electric. The all wheel drive is propelled with four electric motors, with a combined power output of 750 horsepower. The battery, said to be a flat underfloor design, is good for 80 kWh and an EPA range of over 200 miles, and the vehicle's top speed is limited to 250 km/h, or 155 mph. There's DC fast charging at up to 350kW, meaning that the range can be boosted by 60 miles in just five minutes, and induction charging is also available. 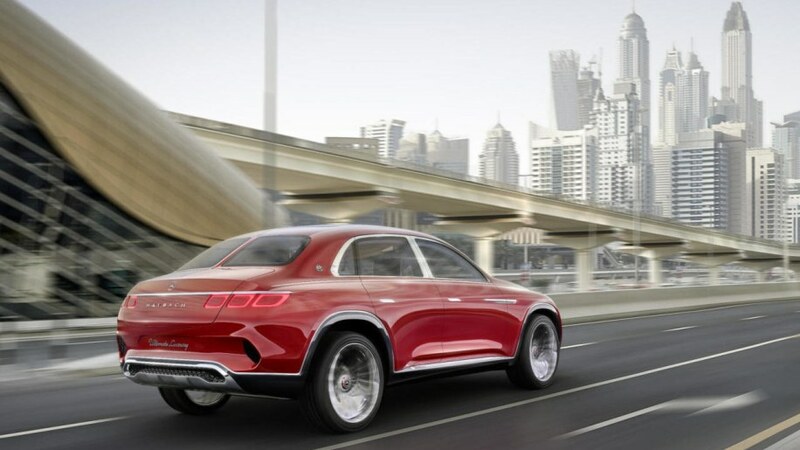 All in all, the vehicle reminds us of the 2009 Lagonda Luxury Utility Vehicle concept, which was also created around a three-box sedan shape and also based on a Mercedes platform, GL-Class in that case. It did not yield a production version, but maybe the Vision Ultimate Luxury will.